Location: Lourdes, in the Lot departement of France (Midi-Pyrenees Region). Notes: Château fort de Lourdes is a medieval fortress located on the French town of Lourdes in the Hautes-Pyrénées department in Languedoc-Roussillon, Midi-Pyrenees. It is strategically located at the entrance of the 7 Lavedan valleys in the Pyrenees. 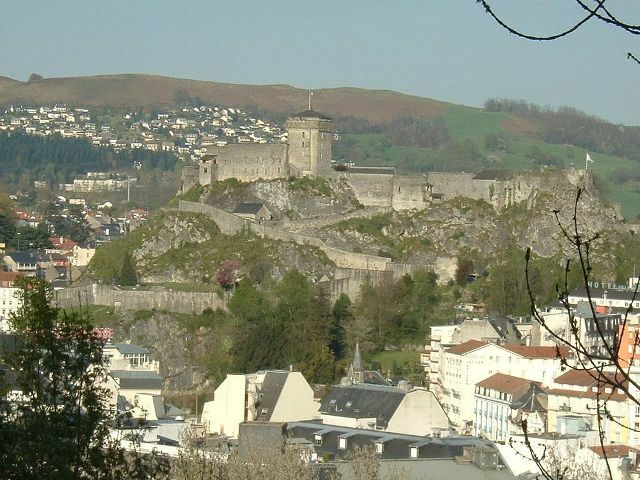 Its origin dates back to Roman times, it was then besieged in 778 by Charlemagne and became the residence of the Counts of Bigorre in the eleventh century and twelfth century. In the twelfth century, it passed into the hands of the Counts of Champagne (also kings of Navarre) before entering the field of the kings of France under Philip the Fair. It is ceded to the British by the Treaty of Brétigny in 1360, before returning to France in the early fifteenth century to the end of two seats. The castle structure was reinforced to the thirteenth century and fourteenth century (construction of the dungeon) and again in the seventeenth century to the nineteenth century. In the seventeenth century, the castle became a royal prison and state after the Revolution, until the early twentieth century when, under the leadership of Louis Le BONDIDIER and his wife Margalide, it became the seat of the Pyrenean Museum (1921 ) that is still home today. It is the largest museum of arts and popular traditions of the Pyrenees. Various remains from the Roman era (fragments of sculpture, votive altars, substructures of ancient walls) have been uncovered in the military engineering work in the nineteenth century. However this work had resulted in the destruction of most of the ancient walls. The discoveries pieces are displayed on site. Today, although still may be some traces of these ancient walls, the oldest remains date back to the eleventh century and twelfth century and are the foundation of existing fortifications. The Chapel of Our Lady of the Castle houses the furniture of the old parish church of Saint-Pierre Lourdes, razed in 1904. The current chapel is built with recycled materials.